Sister Orla received the Mons. Hugh O’Flaherty Humanitarian Award in Killarney on Saturday 4th November. Orla received the award for her humanitarian work in Rumbek, South Sudan. Orla was presented with her award by Mayor of Killarney, Cllr.Niall Kelleher. She was also presented with the Mons. 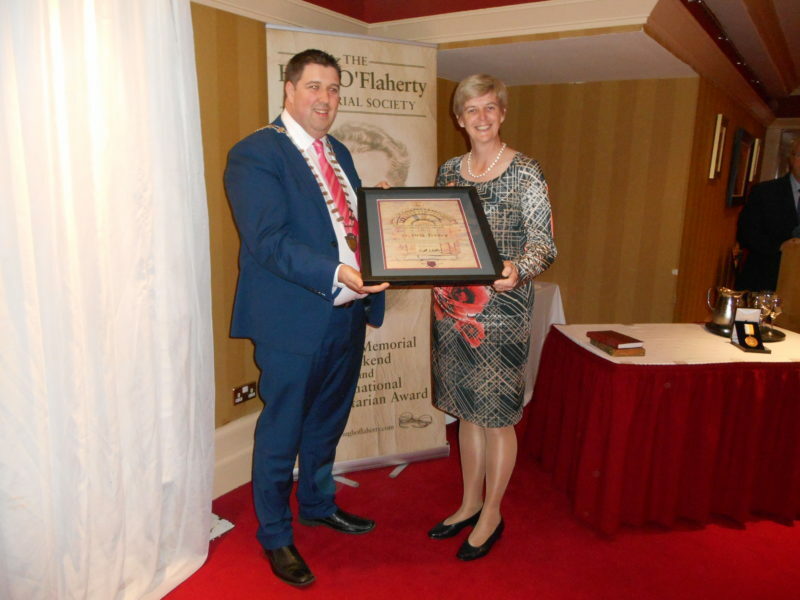 Hugh O’Flaherty Humanitarian Medal by Ms. Pearl Dineen, a niece of Mons. O’Flaherty. The Town Council, family, friends and Loreto Sisters were present at the award ceremony. Sr. Noelle Corscadden, Superior General of Loreto Sisters worldwide, and Sr. Ita Moynihan, Irish Province Leader also joined Orla, together with Srs. Siobhan Quill, Phil Murphy and Brigid Tunney, for this very special occasion. Also present were Orla’s Dad Mr. Blaise Treacy and her brothers. On the following Monday evening Orla was interviewed on the ‘Today Show’ RTE 1 with Maura and Dathai.